Sheffield Wednesday defender Frank Simek admits he does not know when he will be fit enough to play football. The 23-year-old has been sent to Lilleshall to aid his recovery from a serious ankle injury. 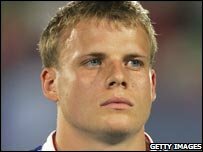 The USA international told BBC Radio Sheffield he is just taking his rehabilitation "day-by-day". "Obviously it's going to take some time and I've got to be patient with it," he said. "There's no real deadline set that I've got to be back by this game." Simek missed the last six months of last season after suffering serious ligament damage during an away game at Crystal Palace in December 2007. Meanwhile, Owls boss Brian Laws has dismissed reports linking Simek with a move to Aston Villa. Laws told BBC Radio Sheffield that they have received no approach from the Premiership club. "Aston Villa have never even made contact, there's no truth in the matter," said Laws.